I have to say that ever since I heard that cold-case homicide detective J. Warner Wallace was working on a new book, I was extremely excited, especially when I heard it would be a book on learning how to be a Christian case-maker. I read and reviewed his two previous books (Cold-Case Christianity and God's Crime Scene). In those books, he brought a unique and powerful perspective, as a cold-case homicide detective, to presenting the case for Christ's resurrection and God's existence. However, many Christians are not convinced that there is even a need to make the case for the truth of our worldview. 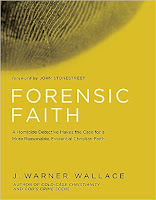 In "Forensic Faith: A Homicide Detective Makes the Case for a More Reasonable, Evidential Christian Faith" (paperback, Kindle, audiobook), Wallace's aim is to appeal to these Christians, who are hesitant about making the case, by presenting them with the biblical reasons for making the case and the resources to do so. J. Warner Wallace begins by telling of his graduation from the police academy in California. As part of the graduation, the new graduates took an oath; they sore to protect the citizens of their state from all threats using the training they had received. This instilled in the new officers a great sense of duty. As an officer of the law and a detective, evidence played an extremely important role in Wallace's everyday life. When Christian officers witnessed to him, he was not impressed because they seemed to have a faith that went against the evidence. However, when he investigated the Gospels for himself, he found the complete opposite: that Christianity made claims about reality that could be falsified or verified by evidence, and Jesus and his Disciples, in fact, encouraged people to believe based on the evidence and witness to others using the evidence. Wallace observes that every Christian believes the claims of Christ based upon the direct evidence of the eye-witness testimony of the Disciples given in the gospels, so having a faith based upon evidence is nothing foreign to the Christian. However, to make his case more powerfully, he takes the reader through the New Testament to show that Jesus encouraged people to believe His claims based on the evidence He offered, and that the Disciples accepted their duty to witness using their eye-witness testimonies (direct evidence). He observes that while Paul explicitly stated that not everyone was necessarily called to be an evangelist (Eph. 4:11), Peter explicitly stated that everyone is called to be a Christian case-maker (1 Peter 3:15). He then takes the reader through early Church history. In this he cites several historical writers at the time who provided evidence to their readers for the truth of what they were claiming about Jesus Christ. Wallace concludes the chapter with a call to every Christian to accept their biblically-established duty to be Christian case-makers for the next generation. In the third chapter, Wallace describes five practices that he exercises in order to investigate cold cases, and he demonstrates how to apply each one in order to have a forensic faith. His first practice is to read the case file completely and know it backward and forward. He must be extremely familiar with the material. The Christian, likewise, needs to read the Bible (Christian file) completely and know it from cover to cover. His second practice is to remember that everything can be evidence, even things that we may not usually consider. When reading the Bible, the Christian must understand that everything contained within its pages counts as evidence in one way or the other. The third practice is to take extensive notes and thoroughly analyze. As we read the Bible, notes should be taken regarding different relationships among passages and concepts, and the claims (along with the specific words used and not used) all need to be thoroughly analyzed. The fifth practice is to organize the data and summarize it. Doing the same with the Bible will assist in understanding and recollection of the investigation. The fifth practice is to look for evidence outside the original case file. For the Christian, most skeptics do not recognize the Bible as a source of truth, so if they are to reasonably believe what it says is true, they need to have evidence from a source that they recognize as valid (which will be outside the Bible). For each one of these practices, Wallace presents an example of application for the Christian that will help in developing a forensic faith. Of course, once we have developed a forensic faith, we cannot keep it to ourselves, we must communicate to those who must decide, a "jury" of sorts. Wallace again draws upon his experience to provide the Christian with principles for communicating what evidences have been uncovered for the truth of the Christian worldview. His first principle is to be insightful in deciding who to present the evidence to. Just as jury selection is important for a trial, so is the selection of the people to present evidence to. He explains that there are generally four kinds of people: Committed skeptics, committed Christians, Christians who are doubting, and skeptics who are doubting. Generally the ones who are most receptive to the evidence are the last three. His second principle is to instruct those you present evidence to on how to examine evidence. It is not always common knowledge how evidence is to be handled; if someone does not understand how evidence builds a case, then they will not likely see how powerful the case is when presented. The third principle is to remember that whoever makes a claim bears the burden of proof, not just the theist (as many atheists would have you believe). Any time that someone claims something (even that God does not exist), it is their responsibility to make a case. Fourth, always remember that possibilities are not arguments against your case or the evidence presented. There will always be unanswered questions, and there always seems to be some speculative way to avoid the conclusion. However, speculated possibilities are not supported by the evidence; the conclusion you present is. Fifth, the more evidence you present, the more reasonable the conclusion. If you claim that something happened, the more support you can present, the more evidentially persuasive the case will be. Familiarize yourself with as many pieces of evidence for the truth of Christianity as you can. Finally, Wallace encourages the Christian to communicate passionately yet humbly; never overstate your case. He concludes the book with a reminder of the importance of the duties of those who are called to "serve and protect" in law enforcement and encourages the Christian to accept the same duty to "serve and protect" the members of the Body of Christ. I had high hopes for this book, and Wallace certainly did not disappoint. While there are numerous aspects of this book to appreciate, the one that stood out to me was his thorough use of Scripture throughout the book to make his case for providing an evidential case for Christianity. One of the principles he's learned in his career as a homicide detective is to "overwhelm" his jury with the evidence for the guilt of defendant so that there is little-to-no doubt in their minds of his/her guilt. His use of Scripture certainly follows that principle. If you have not seen a decent case for presenting evidence for the truth of the Christian worldview, this is the book that you need to read. If you have heard about "apologetics" and have been curious but do not know where to start, this is the book to get. I cannot recommend it enough as the starting point for anyone who feels Peter's call to "be prepared to give a reason for the hope that you have." 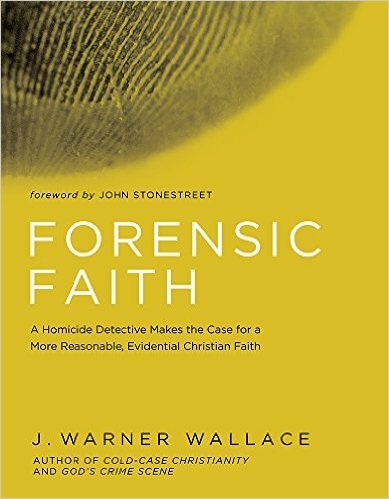 After this one, be sure to continue your development of a forensic faith with J. Warner Wallace's two other great books, "Cold-Case Christianity" and "God's Crime Scene."